Now a Arnie (of The Terminator fame) watch. You read it right. Audemars Piguet and Governor Arnold Schwarzenegger have collaborated to create the ultimate collector timepiece, The Royal Oak Offshore Arnold Schwarzenegger the Legacy Chronograph, a perfect blend of strength and control. This limited-edition timepiece is a vibrant tribute to this long established friendship and like the previous designs in the Royal Oak Offshore portfolio draws inspiration from Arnold Schwarzenegger’s onscreen roles as well as his human values. Like all the timepieces created in close cooperation between Audemars Piguet and Governor Schwarzenegger, the Royal Oak Offshore Arnold Schwarzenegger The Legacy Chronograph is a masterpiece of rugged elegance. Since the collaboration debuted in 1999, the sale of these timepieces has also raised millions of dollars and brought awareness to After-School All-Stars, a charitable organization founded in 1992 by Schwarzenegger. To date charitable contributions from the watches has raised a total close to $10 million. The Royal Oak Offshore Arnold Schwarzenegger The Legacy Chronograph is issued in a 1,500- piece limited edition, each engraved on the back with the inscription Royal Oak Offshore Arnold Schwarzenegger The Legacy. Inspired by the case of the Royal Oak Offshore Arnold All-Stars Chronograph it is the first Audemars Piguet watch to feature an all-ceramic 48-millimeter case middle and bezel. The watch is supplied with an anthracite aramid fibre strap, along with an additional strap in hand-sewn black crocodile leather with large square scales. Proceeds from sale of this model will serve to fund the “After School All Stars” foundation. Schwarzenegger and AP’s powerful partnership dates to the summer of 1998 when the film star, a long-time connoisseur and collector of fine watches, visited Audemars Piguet’s headquarters in Le Brassus, Switzerland. Arnold’s eye for detail and appreciation of superb craftsmanship mirrored Audemars Piguet’s world-class reputation for technological innovation and cutting edge design. The following year, Schwarzenegger collaborated on the design for the first commemorative timepiece which heralded his film End of Days. In the years to follow, the relationship expanded with the establishment of an on-going charitable partnership between AP and Arnold, who during the partnership became the 38th Governor of California. 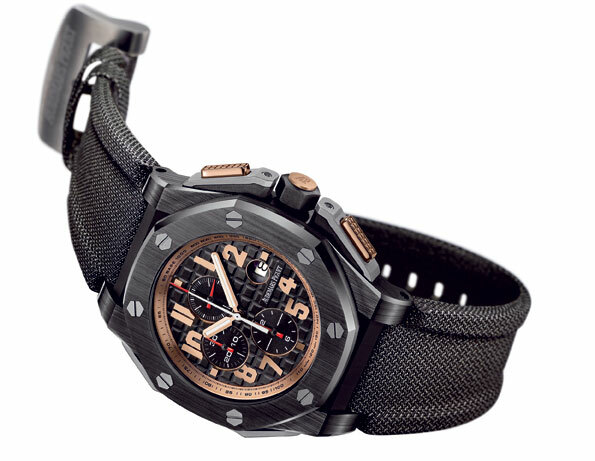 The fruits of these efforts are an array of limited-edition timepieces which include the introduction of the Jules Audemars Double X Chronograph created for The Sixth Day in 2001 followed by the Royal Oak Offshore T3 Chronograph, inspired by the 2003 film The Terminator 3, and the largest Offshore ever produced; the Royal Oak Offshore Arnold Schwarzenegger Chronograph with date and small seconds; a Jules Audemars Chronograph & Perpetual Calendar; and a Jules Audemars Dual Time Power Reserve as well as the Royal Oak Offshore All-Stars Chronograph in 2008. Furthermore, these watches have become highly sought after by collectors and aficionados alike.